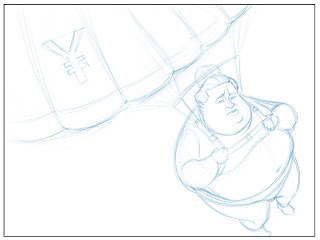 ILLUSTRATION: NOAH KROESE: What's more exciting than currency values? Nothing. What's more exciting than currency values? Nothing. 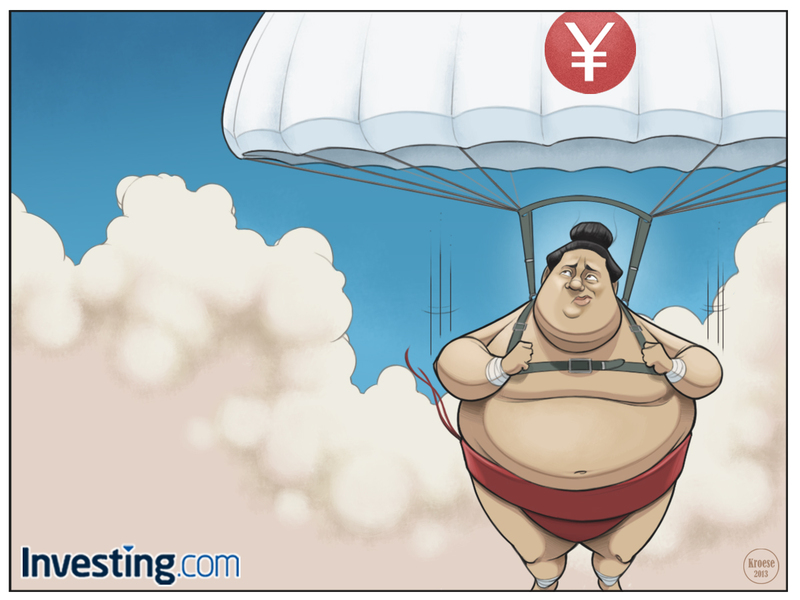 This week's comic for Investing.com deals with the falling value of the Yen. Last week I spent most of the post talking about the situation itself, so I'll focus on the technique more this week (also, I don't actually know much about the falling Yen, I was paying more attention to the Bitcoin thing). This is, after all, a website about illustration. The idea, as is the case with the overwhelming majority of these financial comics, came from the folks over at Investing.com. I received the idea in email form early Wednesday morning. It was basically two sentences: "This week's comic is about the falling yen. We need a sumo wrestler in a parachute with the yen symbol on it." 1.) 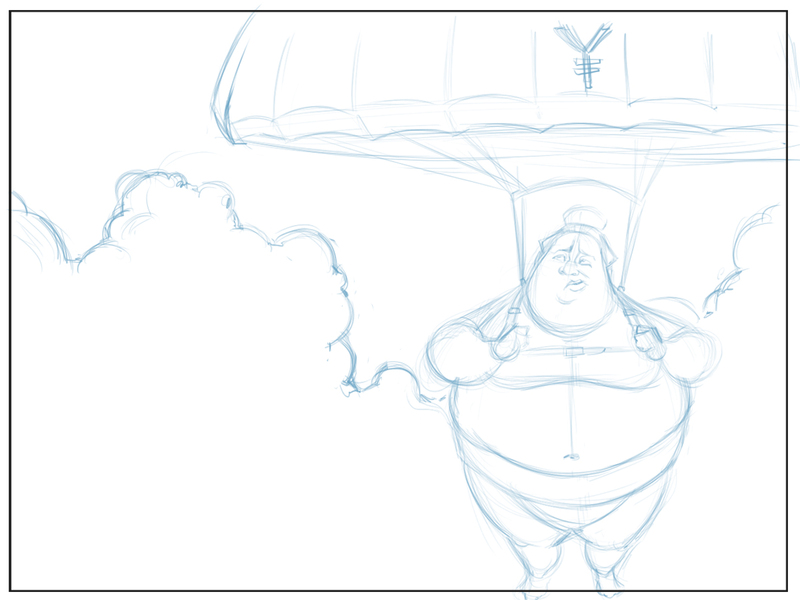 I've never drawn a sumo wrestler before. So...awesome. 2.) Single character. Yeeeaaah! I love single character because it gives me more time to focus on the details of that character (rather than having to spend more time on, say, drawing buildings and lamp posts). 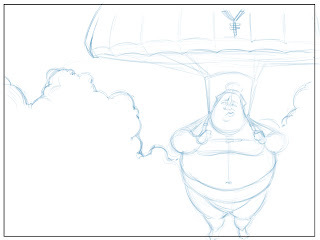 Because I love single character and I'm so comfortable with it, I feel more free to experiment with camera angles, proportions and composition. I thought this sketch was interesting, but I suspected it wasn't quite right for some reason. I thought (and still think) that the first sketch is the more interesting of the two (at least in terms of composition). It's more dynamic. But I thought the second sketch conveyed the idea better. And my job for Investing.com is to tell the story they ask me to tell. It should be well-drawn, of course, but the drawing is in service of the concept, not the other way around, so I went with the second sketch. I think the second sketch is interesting in its own way. It activates three walls, the clouds help direct and focus interest, and it's cropped in a way that's unusual for me, which I think lends to visual interest. This is one of my favorite financial comics so far. I love the composition, the color, the expression. But mostly, I had a lot of fun drawing this one. That probably makes the biggest difference for me. I always hope that when I have fun drawing something, that energy and enthusiasm is visible in the illustration (in the same way I FEAR the boredom is visible in a few drawings of mine). But ultimately, I'm not sure how much an illustration shows other than what can be physically seen, you know? I'm not sure I'm even the best person to judge that aspect of it. These illustrations will grow on you. Saturday! The book! The website! The post!